Note: There are many interesting images on this page. It may take a few minutes for the page to fully load. The curriculum for Elec 435, Electro Mechanical Devices, an Electrical Engineering course at Rice University , requires that class members undertake a project to examine an actuator or sensor which was not covered in classroom lecture. Material gathered is to be presented in a formal report or on a project web page (this document). In addition, there is an in class oral presentation. This course was taught in the Fall, 1996 semester by Professor J. D. Wise . This project web page was prepared by Wayne Herbert who is solely repsonsible for its content. Email me with your comments and questions. If you feel that I have used any proprietary material, or have not given sufficient credit for material obtained from the web, please contact me and I will rectify the situation. One result of the increasing technical sophistication of humankind has been the shrinking of the devices which power our world. Modern internal combustion engines put out far more horsepower per unit of weight and displacement than did their predecessors. Modern electric motors take advantage of high strength magnets and sophisticated windings to produce lots of power in a small package. Until recently though, any power producing device could be seen by the naked eye. Although some attempts were made to create minature motors, efforts were limited by the lack of tools needed to build on such a small scale, and a lack of understanding of the physical forces which occur at this scale. The revolution in electronics miniaturization, perhaps more than anything, has provided a strong impetus in the drive towards ever smaller power devices. Vacuum tubes have been replaced by transistors which can be created by the tens of thousands on small silicon based chips. 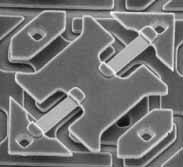 It is this miniaturization, and the attendant advances in micro machining and lithography necessary to create such electronics, that have fostered the growth of micro actuator research and development. Research in this area has been particularly active in Japan, where a consortium of businesses and universities has pooled their resources to maximize the benefits of research. 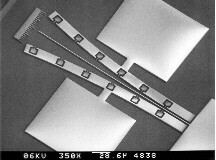 It should be noted that while the field of microsensors is broad and constantly expanding into new commercial applications, micro actuators have found use in only a few narrow applications, because of the difficulty of designing and building devices that can deliver sufficient power and displacement to make them worthy of connection to real world mechanical loads. a silicon wafer is coated with a photographically sensitive material. A mask containing all or some of the desired elements in the final product is laid over the silicon wafer, and it is exposed with light. through chemical processing only the exposed material is left on the silicon wafer (similar to developing film from a camera). These areas may be etched to create holes, wells, or other structures, or they may have additional material laid upon them (such as an electrically conductive material). the process is repeated for each layer to be produced on the chip until the complete circuit or device is present. Electrical connections are added to the circuit, and it is wrapped in a suitable package to protect it. 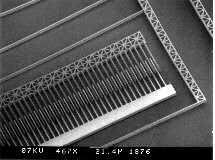 A major advance in the construction of micro actuators is a lithographic technique called deep x-ray lithography (DXRL) , a process which allows much deeper etching in silicon, and hence more robust micro devices such as the mold for a micro gear shown below. This gear is 400 micrometers in diameter. Continued advances in lithography, such as x-ray lihtography, atom lithography, and electron lithography, are making micro construction all the more practical. 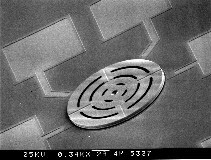 Micro machining is accomplished through the use of equipment such as lasers, scanning electron microscopes, and scanning tunneling microscopes. IBM has successfully created their logo using a scanning tunneling microscope to move individual atoms to their correct location. Bell Labs is using finely focused, low power laser beams as tweezers to grab cells and other organic material. As might be expected, virtually every type of force generating mechanism conceived has been implemented in the world of microactuators. Force generating mechanisms fall into the categories of electromagnetics, capacitive (electrostatic) devices, piezoelectrics and ultrasonic devices, and fluid driven devices. As noted above, virtually all of these devices are created in silicon using lithographic techniques. In the area of electromagnetic devices, several companies have produced conventional electric motors at a micro scale. For example, Yasakawa Motors has created an electric motor which uses .2 mm wires and thin film magnets to drive a 2.5 mm diameter two phase rotor. Nippondenso Corporation has created a 1.0 mm motor using a permanent magnet rotor which develops a micro newton-meter of torque when supplied with 3 V at 20 mA. Several companies have also produced linear stepper motors which are designed to insert micro miniature catheters into a variety of materials, including cells. One of the primary advantages of electromagnetic devices is their high power output compared to electrostatic devices. However, electromagnetic motors suffer from several problems. The largest of these problems is fabrication. 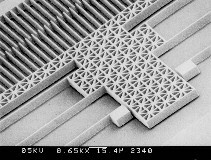 Almost all fabrication is done using a silicon substrate and using lithographic techniques borrowed from integrated circuit manufacturing. It turns out to be very difficult to create electromagnetic coils and permanent magnets in silicon using current technology. Instead, such items must be "glued" to the package once assembly is complete, thereby limiting placement and increasing costs. However advances in electromagnetic motors are being made as evidenced from the two motors shown below, courtesy of the University of Sheffield , United Kingdom. Both are three phase inductor motors; the one on the right uses an aluminum rotor. A booming area in micro actuators are the piezoelectric devices. These devices use an interesting phenomenon found in some crystals, namely, that a force upon the crystal (a distortion) produces a voltage, and when a voltage potential is placed across the crystal, it distorts, creating a force. The earliest work in piezoelectrics was done by Pierre and Jacques Curie in the 1880's using tourmaline, quartz, and cane sugar cyrstals. Modern piezoelectric devices are ceramic composites and feature a very high range of motion for a given electrical input when compared to early crystal forms. In addition, the ability to lay these ceramics as thin films onto silicon substrates, through sputtering and other processes, has enabled these devices to be readily integrated into the world of electronic integrated circuits. Advantages of ceramic piezoelectric devices include very high resolution, zero "sticking" friction, fast response, no wear, high stiffness, and relatively low voltage (100 V) operation. Disadvantages include a very short range of operation, mostly linear motion, and fairly high cost. Rotating devices can be constructed which use bending elements constructed in a rotor. The elements bend when a voltage is applied, and catch in cavities in the wall surrounding the rotor, causing the rotor to turn (see also Ultrasonic Devices, below). Piezoelectric actuators are amongst the most developed of all micro actuators and several companies have taken them out of the lab and into the commercial world. Examples of packaged actuators (no, the package is not micro miniature!) are shown below. For more information concerning ongoing piezoelectric motor research, try the University of Missouri-Rolla . A most useful application of piezoelectric devices is in the construction of ultrasonic motors. A piezoelectric device operates at a very high (ultrasonic) frequency while sandwiched between the rotor, stator, and a friction liner. Each pulse of the piezoelectric device causes it to expand against the friction liner, driving the rotor. 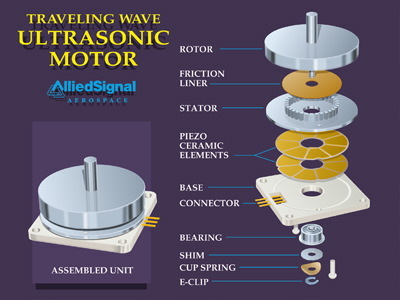 Adavantages of the ultrasonic motor include high power in a low volume (higher even than an electromagnetic motor), and high torque at very low speeds. The primary disadvantage of these devices is the relatively low operating life because of the wear between the resonator and the rotor. Thus, these motors will be found in intermittent use applications such as the motor which drives the focusing ring in autofocus cameras. An example of an ultrasonic motor is shown below. Again, try the University of Missouri-Rolla for lots of useful information concerning ultrasonic motors. An "odd" type of ultrasound related actuator is the vibration driven device. The actuator works by being coupled to the outside world at some resonant frequency, wherein the vibration creates motion within the device. An interesting application of this technology is a mechanical ant whose limbs are connected to such devices, and which will walk when placed upon a vibrating platform. A picture of this device is shown below. All electrostatic devices operate on the principle that opposite charges attract. 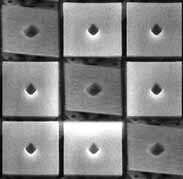 There are multiple ways in which this phenomenon is implemented in micro actuators. One such implementation is the cantilever beam. A bendable beam, which is also one of the electrodes is placed between two more electrodes. Upon application of suitable voltage, the cantilever device bends. This devices offer motion in the range of 10's of micrometers, and forces ranging into the 10's of mN. An example of such a beam is shown below. Yet another type of electrostatic motor is the wobble motor. Stator poles are placed around a disc (rotor) which is at an angle with respect to the plane of the stator poles. As a voltage is applied to each stator, the disc is attracted to that stator and "wobbles". Connected to the disc is an inner ring which provided continuous rotational motion derived from the wobble. Such motors offer 10's of RPM and fairly strong torque characteristics. In addition, they are readily fabricated on a silicon substrate. Still another type of electrostatic actuator is the comb drive. Two sets of interlinking "fingers" attract or repel one another creating linear motion. An example of a comb drive is shown in the pictures below. In addition to the more "mainstream" types of actuators described above, two other actuator types are worthy of mention. The first is a micro scale steam engine. This device was originally developed at Sandia Laboratories. It is constructed with a piston driven by a steam source. Its big advantage over other device types is the large amount of force that it can generate, about 1.16 uN, or about 100 times the force generated by a typical electrostatic device. On the down side, it is a very slow machine. It takes approximately .1 second for the thrust cycle, and 1 second for the piston to return to the beginning of its stroke. In addition, the water evaporates over time, so it eventually loses its driving fluid. The second "odd" actuator type is a fluid driven gear system, essentially a tiny version of a turbine or water wheel. 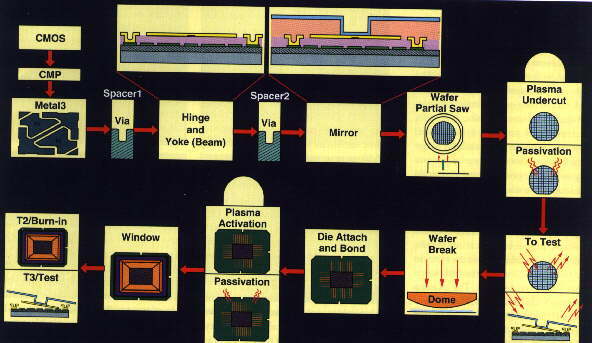 Pathways for water or other fluid are etched into a silicon chip, along with the "vessel" which holds the rotating water wheel. The bearing for the wheel is also etched into the silicon. A small gear like wheel acts as the turbine. Once inserted, a covering piece of silicon is added, with access to the wheel's shaft. An advantage of this device is a complete lack of electric or magnetic fields, making it suitable for use in volatile environments, or where electromagnetic contamination might affect sensitive measurements. A disadvantage is the complex support equipment consisting of pumps, hoses, and valves. One of the more fascinating applications of electrostatic actuators is the "Digital Micromirror Device", or "DMD". Developed by Larry J. Hornbeck of Texas Instruments, Digital Light Processing, this device combines aluminum alloy mirrors, silicon based electrostatic drives, and silicon micro electronics to create a "light switch". 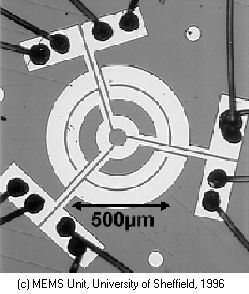 Because the entire device is micro machined on a single silicon chip, each mirror is so small that "dozens of them are covered by the tip of a standard straight pin". It is expected that these mirror devices will play a major role in the next generation of video displays and hard copy printers. An example of the device is shown below. This is an 848 x 600 Digital Micromirror Device. The central, reflective portion of the device consists of 508,800 tiny, tiltable mirrors. A glass window seals and protects the mirrors. Each mirror is 16 um on a side. The incredible degree of miniaturization found in micro electronics seems all the more awesome when combined with mechanical devices. 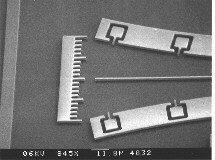 The two together are called "Micro Electro Mechanical Systems" or "MEMS". 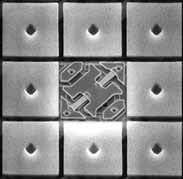 The DMD is a "monolithically integrated" MEMS cell, which means that the entire structure which is about to be described is created in a single lithographic/micromachining process. Certainly, the process itself is very complex, but the important fact is that this mechanical device can be created just as an integrated circuit would be built. 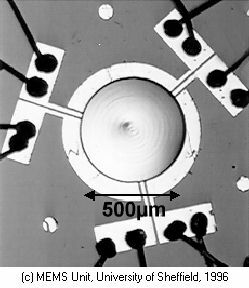 The alternative process, for example, that which might be used to create an electromagnetic micromotor, requires that silicon processing be followed by another process such as gluing a permanent magnet to a sillicon base. the memory cell and associated electronics are laid down on the silicon substrate. These steps closely follow current integrated circuit production techniques. using a specially layered overlay, the electromechanical parts of the cell are created. This includes the electrical contacts (mirror electrodes, yokes electrodes), and the mechanical parts (the torsion hinge, mirror support post, electrode supports). aluminum alloy is overlaid on the mirrors. Then, through a deep etching process, the material between the base electronics circuits and the mirrors is removed to provide the air gap necessary to allow the mirror to tilt. Interestingly enough, the entire manufacturing process closely follows standard techniques for semiconductor manfacture. Lithography, sputter metal deposition, and plasma etching are all used in the DMD process. 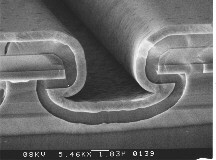 Even the sacrificial layer is a standard hardened positive photoresist layer. However, there are steps in the process which are different (and undisclosed, apparently due to the proprietary nature of the process). 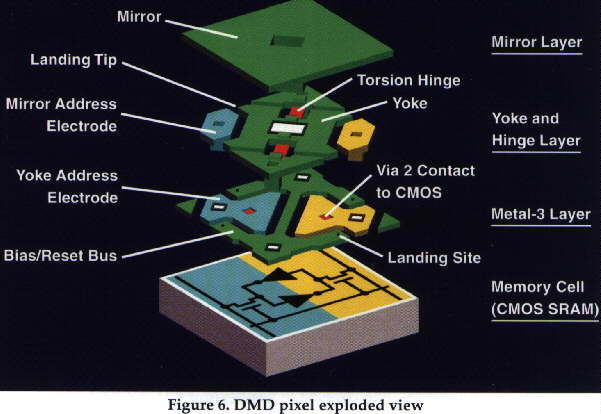 The first figure below outlines the general processing flow for a DMD chip, while the second provides a more detailed view of the manner in which the DMD portion of the chip is actually constructed. The mirror is connected to the yoke which can rotate on the two torsion hinges which run through it. Under the yoke itself are the yoke address electrodes. The yoke is attracted to one or the other of the yoke address electrodes depending upon which is energized. Which of the electrodes is energized depends, in turn, upon the status of the memory cell directly beneath it. A "one" stored in the cell causes the mirror to move to a + 10 degree position (at which point it contacts the yoke and becomes mechanically connected via the landing site contacts). When the memory cell contains a zero, the mirror moves to a - 10 degree position. When the memory cell is neither, no electrostatic force is applied to the mirror and the torsion hinges cause the mirror to return to 0 degrees. When a mirror is fully tilted in either direction, and has made contact with the yoke base, a bias current keeps the mirror in place irrespective of changes in the address electrode. This enables the mirror to remain in the correct position even while a new bit of data is being loaded into the cell memory. An example of the positive deflection position, as well as an actual picture of the mechanism underlying the mirror (the yoke and torsion hinges are readily observable), is shown below. 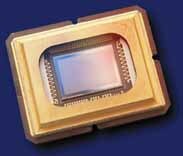 The DLP chip can be utilized in three different ways to project an image. All are discussed in some depth at the TI Digital Light Processing Web Site . Of the three methods, the simplest implementation uses a single DLP chip. 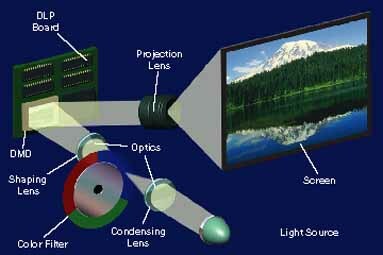 The mechanical construction and layout of the projection device is shown below. A white light source is projected first through a rotating color wheel, through a focusing lens, and then onto the DLP chip. Light from the chip, when the mirrors are correctly positioned, is reflected to the projection lens, and from there to the display panel. 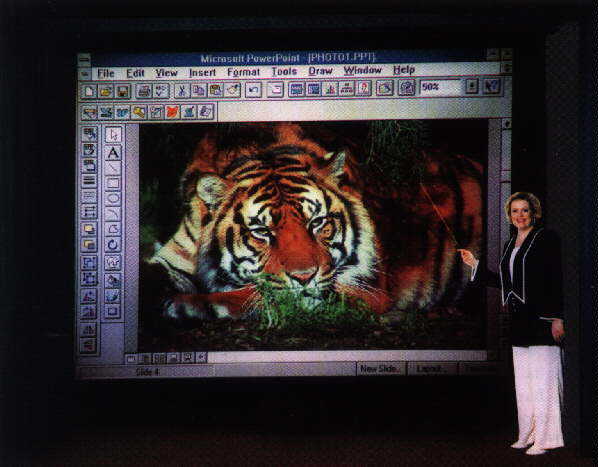 A one-chip DLP projection system. White light is focused down onto a color wheel filter system that spins at 60 Hz. This wheel spins in sequence with the red, green, and blue video signal being sent to the DMD. Mirrors are turned on, depending on where and how much of each color is needed for each TV field. The human visual system integrates the sequential color and sees a full-color image. Details of the video display operations follow. The color wheel rotates at 60 rotations per second. This means that there are 180 color changes per second as a result of the turning wheel. This means that each color passes through the light source for approximately 5.56 ms for each revolution of the wheel. Thus, if the color for a particular pixel is to be switched on, the mirror must be capable of moving to its correct position in less than 5.56 ms. In reality, the mirror can be move from one maximum deflection to the other in a period of less than 20 microseconds. This means that for any given color, the mirror for any pixel can move a total of 5.56 ms / 20 us = 278 times while the color is moving past the light source. Or to put it another way, the length of time that a mirror can be turned towards the projection lens can vary from 1 part in 278 to 278 parts in 278. Rather than use 278, one byte of 8 bits is used to control the mirror movement. 8 bits yields 256 possible timings for the mirror. The cycle for one frame of display proceeds as follows. The video signal is received by the chip and is separated into its red, green, and blue components. For each color component (let's work with red), its intensity is translated to a value between 0 and 255 and stored in the mirror control byte. Using the reset/latch bias currents, all mirrors in the array are returned to their neutral position. Then the most significant bit is sent to the mirror memory cell and the latch current is turned on. If the bit was a 'one' the mirror deflects towards the projection lens and is latched; if 'zero' the mirror deflects to - 10 degrees and no light is sent to the lens. While the mirrors are latched in place, the next bit in the intensity byte is sent to each mirror's memory cell. Once in the cell, the reset/latch bias currents return the mirror to the neutral position and then either to + 10 degrees or - 10 degrees, depending once again upon the contents of the memory cell. This process continues until all the bits in the intensity byte have been transmitted to the memory cell and the mirror moved in response. It should be noted that the total time that a mirror is "on" depends on which bit is being processed; the most significant bit stays "on" the longest while the least sifnigicant bit is the shortest. Thus, to process a single frame of video each mirror will move 8 times; for maximum intensity, all 8 times will result in a positive deflection, while minimum intensity results in 8 negative deflections. Intermediate intensities require that the mirror move in both directions at a ration equal to the desired intensity. It should be noted that with the single mirror chip system, only one third of the total light intensity is actually transmitted to the projection lens since the other two primary colors are always filtered out. This problem is readily overcome by the use of three DLP chips which are run together synchronously. The light from the white source is prismatically split into the three primary colors and forwarded to each DLP chip. A further advantage of this method is the ability to use even higher color resolution than that available with a single chip. Since any given mirror need deal with only one color during a given cycle, the total amount of time, and hence the total number of times the mirror may switch is increased my a factor of three. Given that a chip which will support super VGA resolution (800 x 600) will contain nearly a million hinges, hinge fatigue could be a serious problem. However, the device has been tested by subjecting each mirror to more than 1 trillion cycles in an accelerated period. This is equivalent to about 20 years worth of normal use without failure. Other problems, including the sticking of the mirror to its landing site (stiction), and the permanent bending of the hinges so that the mirror no longer returns to a flat position have been overcome with the selection of suitable materials. Initial applications will include a business projector and a board with the chip which can be integrated into a complete video system. TI has created a very large display (shown below) to demonstrate the brightness and effectiveness of the DLP chip and DMD technology. "Micromechanical Sensors, Actuators, and Systems, D. Cho, et al, A.S.M.E. This page was last modified on December 13, 1996, AD. God bless the Queen. If you have kudos and accolades for this page, contact Wayne Herbert, but if you want to gripe, try Art Farkel.